Katie and Kristen from the Bring Me Hope Team have been hitting the road this Spring to spread the word about the orphan situation in China. “We’ve seen God work in amazing ways during our speaking tours,” Kristen Chase says. “People are open to hearing the truth about what these children go through and by God’s grace they are responding! This entry was posted in Bring Me Hope News on April 20, 2010 by admin. 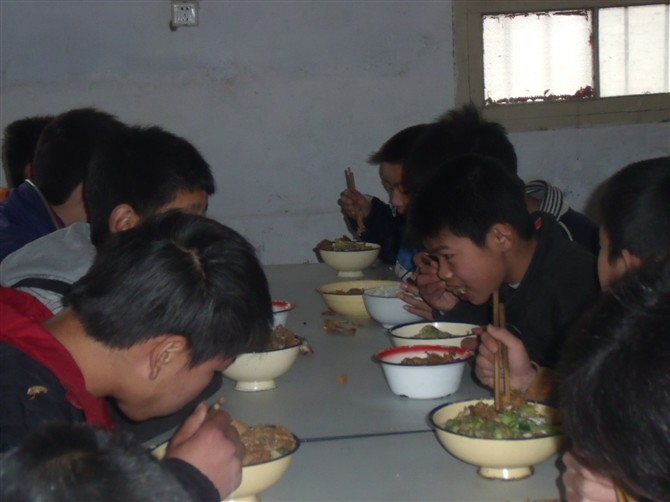 “I went to the XinXiang Orphanage with eight other Bring Me Hope Club Members. We decided to help the orphans with their lives and their studies. This orphanage is a special one because the children’s parents are in prison as a result of family violence. We stayed with the children for only one week, and we all became best friends. 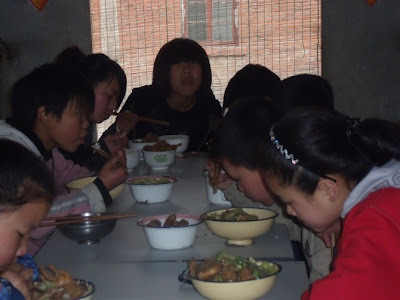 There are about twenty five children in this orphanage, and six of them are girls. The average age of these children is twelve. They are very polite and adorable, living together like a big family. 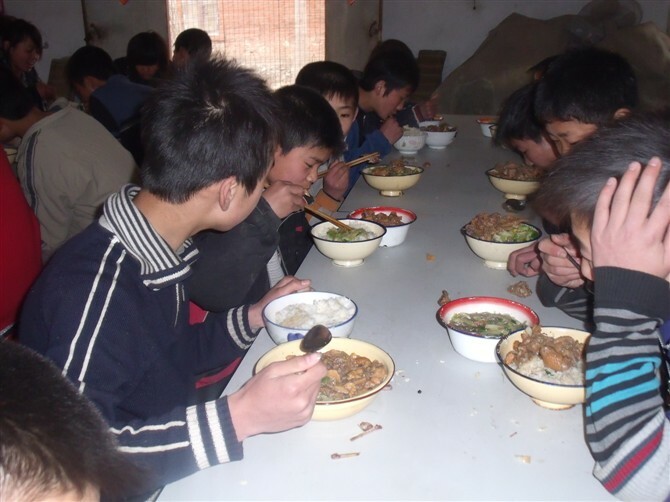 During that week, we shared every meal together with the children. 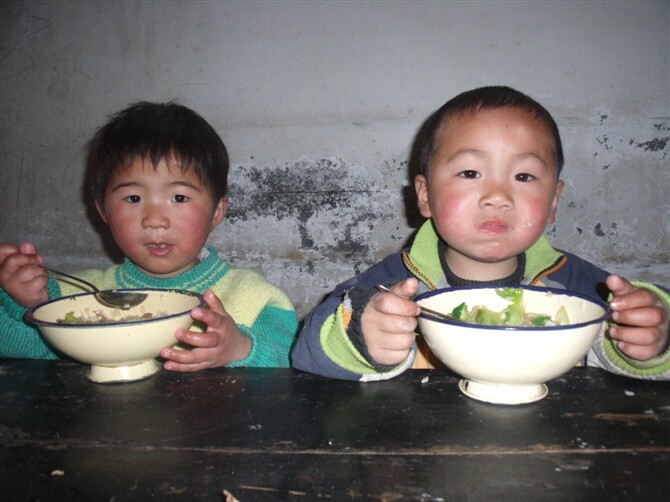 However, I found a problem: there were no fresh vegetables for the children to eat during breakfast or supper. 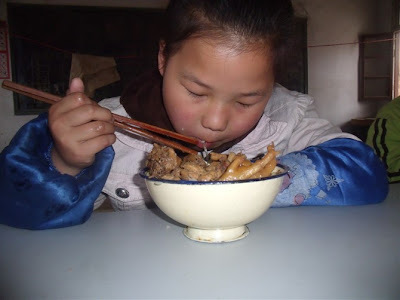 The children eat the same food every day. For breakfast, there is only porridge and mantou (Chinese rolls). For lunch there are some noodles with only a little bit of cabbage. For dinner they have porridge and mantou again. Every day the meals are the same. When I had dinner with them, I often felt sorry for them. Their bodies are in an important stage of growing up, and they need to get enough nutrition to strengthen their body every day. After I left the orphanage, an idea occurred to me: We should do something to change the situation. 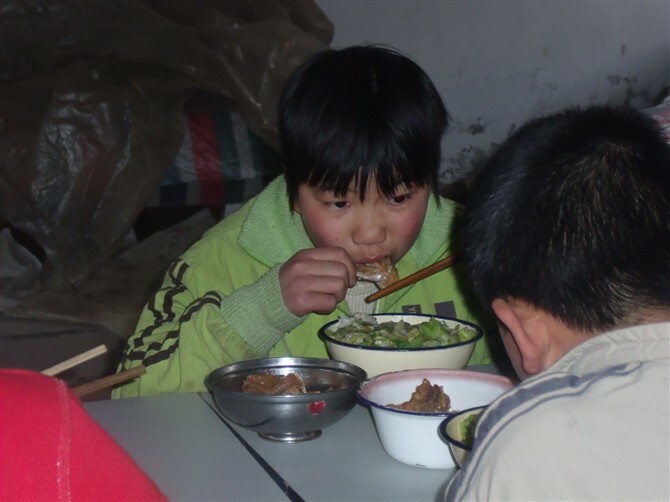 I estimated that it would take about 2,000 RMB every month to provide them with vegetables (or sometimes milk) at every meal. It is really on my heart to help these children to grow up healthy. Personally, I will donate 300 RMB every month, but that was not enough. So I sent out an email to all of my foreign teachers asking for their help. Below are some pictures of the children at the XinXiang Orphanage eating vegetables, thanks to a Chinese University student wanting to make a difference! This entry was posted in Bring Me Hope News on April 15, 2010 by admin. Right Click Save, Print, & POST the Night Walk Flyer!!! We need your help! This entry was posted in Bring Me Hope News on April 14, 2010 by admin. “Hannah’s Story” wins Best Documentary! Hannah’s Story won “Best Documentary” at the Fallbrook Film Festival yesterday! Thanks for all of your support! This entry was posted in Bring Me Hope News on April 12, 2010 by admin. Bolts visit University Clubs in China! Brother/Sister team David and Rebecca Bolt have been busy visiting Bring Me Hope University Clubs in China this Spring! They are reconnecting with college students who have a heart for orphans as well as encouraging them of greater ways to be involved in the kids lives. Please keep them in your prayers! This entry was posted in Bring Me Hope News on April 7, 2010 by admin. We have arrived back from China safe, sound, and blessed. We did not have internet in China so I am afraid that this may be a long update but so many amazing things happened while we were there and I want to share them with you! So wow we had nine days of craziness, joy, and love. We arrived at Eagles Wings orphanage and were greeted by about fifteen children that could not wait to see us. We played all day long with Si Yan and her friends (many of them were also at camp this summer and it was so fun to reunite with these children. I even got to see Bei Bei- this was the little boy that had an infected foot this summer, I was able to take him to the hospital and watch the Lord really do a healing work. Now he is walking around on his foot fine. It is all healed up and his foot is still functioning!). Okay back to the story, so we played all evening and put them to bed. The next morning Si Yan, Sarah, and I headed off to the speed train to start our adventure. We did not take a translator with us so it made life really interesting. It actually worked out really well and caused us to bond even more with Si Yan. So we took the train to Xi’an where Sarah got pick pocketed as we left the train station! Thank Jesus that her passport and all the money that had been donated for Si Yan was in a different place in her purse. We then met up with the Vidlers, some very good friends of mine who are doctors there in Xi’an. It was such an encouragement to catch up with them and visit with old friends! They introduced us to Rowen (a cerebral palsy physiotherapist from Australia). He did a physical assessment on Si Yan. I sat there watching her go through various tests of strength like a very brave little girl, making eye contact with her as much a possible as assuring her she was doing such a good job- and thought to myself “we can’t just leave her here. Why does she have to be so brave for herself? How many doctors has she visited and nothing has changed? We can’t just bring here to this doctor and leave her in the same state. How hopeless that must feel for her-with no one to comfort her”. My heart just broke and I started to cry. She needs a family, medical help would be nice, but even more wonderful would be arms to hold her and love her forever. After the appointment Rowan was very optimistic. He said that with the way her condition had progressed he could see her perhaps even learning to walk with the proper therapy. Sarah and I were thrilled and got as much information as we could on what needed to be done. The next day we did a wild game of hid and seek with various prosthetic boot and medical appliance stores. I think we spent about three hours within the span of three blocks trying to find different stores and getting crazy directions in Chinese, so fun. We found some doctors that could make individualized prosthetic foot braces but discovered that Si Yan would need to come back in two weeks to get them fitted and adjusted if necessary. That would not be a possibility as Xi’an is far away from her orphanage and there would be no one to take her back. Sarah thought quickly on her toes though and asked if they knew of anywhere in Zheng Zhou, as that was close to her orphanage and we would be there the next day. They found a place and we were able to get an appointment for the two days from that day. We were very excited! That afternoon we took Si Yan to see the Terra Cotta Warriors (the 8th wonder of the world apparently). 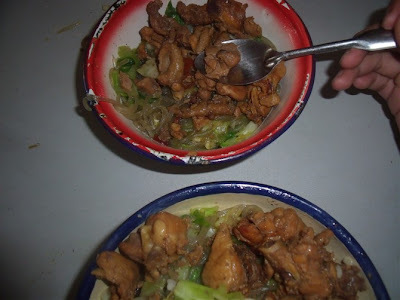 It was really neat and Si Yan really enjoyed it. She referred to the many statues as her “peng you’s” (friends in Chinese). She is pretty much the cutest thing ever and so very smart. She could understand most of what Sarah and I said to her in English! We said goodbye to my friends and headed back to Zheng Zhou. The next day we met with the prosthetic specialists. God gave us so much favor with them! They absolutely LOVED us! They took molds of her feet and brought up sample boots that had cute pink flowers on them. We were all so excited about it. They were so sweet, they shut down the place and about 5 doctors, some designers, and the head of the whole place took us out to a really fancy lunch. They thanked us for what we were doing for China. I exchanged e mail addresses with the head doctor’s daughter so it will be nice to stay connected with them and maybe build a relationship. After that we took the bus back to the orphanage. All the children were so happy to see us back. Si Yan showed off her new things and shared some toys that we had gathered along the way. Sarah’s translator from camp this last summer came to visit us and the kids. That night there was a major dust storm (the biggest one they had had in four years)! Not going to lie, it was scary. It though the building was going to come down on top of us! I kept reciting 2 Timothy 1:7 (the verse my mom taught me to say when I was scared during the night when I was little) and we made it through the nigh. But despite the wind, the next morning (in true Sarah fashion) we bundled ourselves and Si Yan up and went to shop at an outdoor market! It was so much fun and very windy, but a memorable experience for sure! While we were out we bought treats for all the kids and brought them back to the orphanage. They were very excited and we played the rest of the night. So it was such a blessed and successful trip. We accomplished more in a week than what otherwise may have been done in a month. We had so many moments where God sent us Chinese angles (to help us get on the train, to help us carry everything, to help us find our way, or order a meal). We saw the marring judgment of evil as people looked at Si Yan in disgust, but we also were enraptured by compassion and grace which was not merited. Thank you all so much for your prayers. We could feel them and saw them in action. We are claiming that Si Yan will walk soon!! We got to love on her and spoil the heck out of her for a week and it blessed us probably more that it blessed her. Pray for a family for her and also that her muscles and bones will be strengthened to walk! Love you all so much, blessings and grace to you from our Lord and Savior! This entry was posted in Bring Me Hope News on April 4, 2010 by admin.